The US Mint halted silver dollar production in 1804 due to low demand and heavy melting losses overseas. In 1836, another try at coining the nation’s primary silver monetary unit unfolded with the design of Christian Gobrecht. The very first 1836 dollars off the press situated Gobrecht’s name prominently in the field of the coin just below the base of Liberty. Responding to sharp criticism in a newspaper opinion piece, the name was relocated less noticeably to a spot at the bottom of the base. Gobrecht’s Seated Liberty theme was soon thereafter adopted for all US silver coinage, where it remained until 1891. All Gobrecht Dollars are extremely rare, including the 1836 circulation issue. Even advanced collectors of high means must have patience while searching for an available example of this interesting and historically significant type. There are several different varieties of the 1836 Gobrecht Dollar. The most "common" one, if you can call it that, is the variety intended for general circulation, with Name on Base. 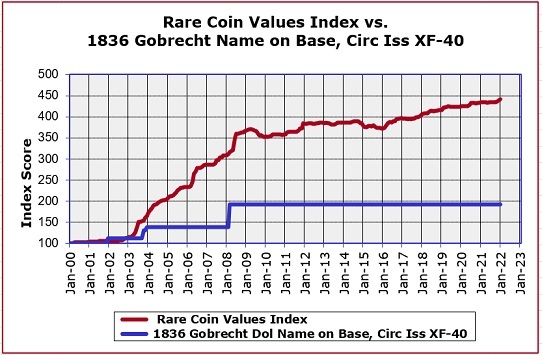 As rare as it is, the 1836 Gobrecht Dollar, Name on Base actually falls considerably below the Rare Coin Values Index. The percent value increase of the 1836 Gobrecht Dollar is shown in the chart above with the blue line. The red line shows the performance of the Index. Both start at Year 2000 as a baseline. The Index score is determined by the percent change of a pre-selected group of 87 rare US coins. The 1836 Gobrecht Dollar Name on Base is one of the 87 coins tracked in the Index. The Index yields clues as to the direction and strength of the overall rare US coin market and is updated monthly.